Sometimes the best projects come from collaboration!!! When Pit Ginsburg at Bespaq sent me the baby house with the gorgeous glass doors that I had requested he make he commented that I would "make a department store" out of this one. Then my friend Moonyeen suggested that it would "of course" have elevators instead of stairs. And collaboration with Larrell proved to me that yes, we COULD electrify 7 rooms in a baby house without circuit boards or messy, bulky wiring. I'm so pleased to present the result of lots of planing and imagination in my latest online project. Housed in a beautiful bespaq baby house, which stands 8" tall, is my new department store. 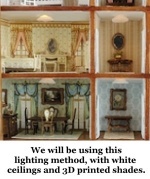 Furniture and fixtures average between 1/87 and 1/90th scale**See note regarding scale at end of listing. The first floor features a tiny jewelry store, and a lovely tea room. The second floor features a flower shop and Perfumerie, and the top floor contains a darling hat shop and dress shop. Travel between floors is done in comfort in our lovely Victorian birdcage elevator. From the tiniest beaded jewelry displays, to shopping bags and trimmed hats, no detail has been omitted. All six shops as well as the top floor of the elevator are each lit with an led chip. 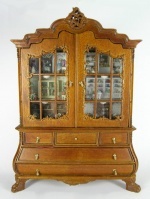 This unit is COMPLETELY SELF CONTAINED. Just open the center drawer in the front and you will find an easy to change battery and ON/OFF switch. Whether displayed in a room setting or as a freestanding display, this lighting set up means NO wires anywhere!!! NOTE: since 2011, available lighting options and techniques have improved vastly. We will use the same technique for this project as we used in Cynthia's Baby House. We will have white paper covered ceilings and 3D printed shades. Our new method makes for easy, foolproof installation. Please refer to the photo below to see the results. All supplies and materials for this project are included. You will need basic tools, paints, glue, brushes, etc. All furniture and shop fixtures are precision laser cut and larger pieces assemble with an easy slot and tab method for perfect results. Wallpaper, carpeting and all accessories are included. An extensive online tutorial will be provided. The top inset panel is red "marble" laser cut to gold. It can be personalized with the name of your choice. Please specify what store name you would like engraved on your panel at the time of ordering. Photo and written instructions for each step of the project are always provided. You will have the pleasure of working from the comfort of your home, at your own pace, which always produces the very best results. There are lots more photos below. Take a look. I know you will be as amazed as my friend Pit was in the pic below! We miss him every day and are pleased to offer this project, which he was so pleased with, again to our students. I know that there is a TON of controversy over which scale is "correct" for baby houses. I asked Pit who designed the baby houses, and based on his answer, I can assure you that there IS no one correct scale The overall babyhouse piece is designed in 1/12 scale. The rooms have very high ceilings in order not to present you with "dark holes". 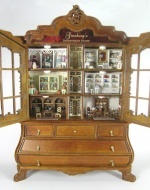 In the day of the original baby houses, dollhouse furniture was generally significantly larger than 1/12" scale. Historically speaking, there is no correct scale. Taking all of these things into consideration, I decided early on that I would pay less attention to the ruler and more attention to a nice finished piece. My individual pieces average between 1/87 and 1/90th. I felt that a department store would have higher ceilings than a residence and designed accordingly. Frankly I do each piece of furniture until I find that all of the pieces in a room are balanced, in proportion to each other and pleasing to the eye. To me, that means more having an empty looking room with undersized, short furniture that might be correct by someone's calculations somewhere.